Clay Olinger works to get his opponent flipped on his back for the pin during the wrestling triangular held in Woonsocket on Thursday night. Last Thursday, Jan. 25, the Woonsocket gym floor looked very different to most spectators. It was covered with a large foam mat for the first wrestling event to take place in Woonsocket since 1978. What started first as a triangular, went to a quadrangular, and then ended as a triangular again, was a huge success for the Wessington Springs/Woonsocket Blackhawks wrestling team. They competed and won against both Chamberlain JV and Sunshine Bible Academy. There were many people in attendance, which was very lucrative for the Pony Hills Youth Wrestling Club, as they were in charge of concessions for this event. 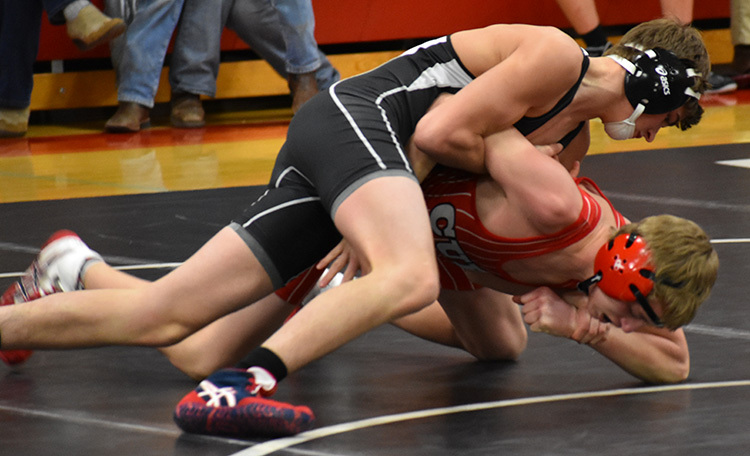 The wrestling team will see its next event on Saturday, Feb. 3, at the Big Dakota Invite in Ft. Pierre. Action starts at 10 a.m.